This collection brings together a group of highly respected law and religion scholars to explore the funding of religious heritage in the context of state support for religions. The importance of this state support is that on the one hand it illustrates the potential tensions between secular and religious values, whilst on the other it constitutes a relevant tool for investigating the question of the legitimacy of such financial support. The funding logically varies according to the national system of state-religion relationships and this is reflected in the range of countries studied, including: Belgium, Bulgaria, Denmark, France, Italy, The Netherlands, Spain, Turkey, and the United Kingdom. 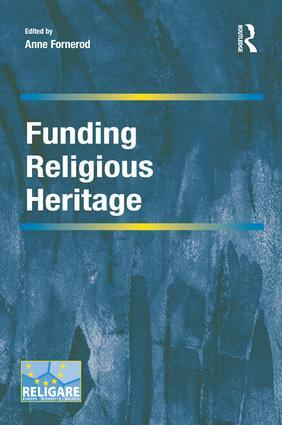 The book provides clarity in the assignment of funds to religious heritage, as well as seeking to define the limit of what relates to the exercise of worship and what belongs to cultural policy. It is clear that the main challenge for the future lies not only in managing the dual purpose of religious monuments, but also in re-using these buildings which have lost their original purpose. This collection will appeal to those interested in cultural heritage management, as well as law and religion scholars. The views expressed during the execution of the RELIGARE project, in whatever form and or by whatever medium, are the sole responsibility of the authors. The European Union is not liable for any use that may be made of the information contained therein. "For the immediate future it will be a useful source of reference for the legal framework and support mechanisms fbr religious heritage, plus insights into how they have come about, in a number of European states, (plus Turkey and Quebec). On another level it presents some interesting questions about the church in the modern world which are worth pursuing." Anne Fornerod is a researcher at the CNRS-University of Strasbourg centre of research DRES. She did her PhD in public law at the University of Paris XI (2006). Her works address several issues in Law and Religion: religious heritage, principle of laÃ¯cité, State support for religions, chaplaincies, cemeteries and ECHR freedom of religion. She edited a book on chaplaincies in 2012 and published one book and several papers on cultural and religious heritage (2013). She was a member of the RELIGARE-project.